I have never been a massive fan of primers in general, aside from a few setting sprays and priming waters. As a sufferer of dry skin, silicon primers tend to dehydrate my base, making for patchy makeup application. A new year discovery of mine was the Too Faced Hangover Primer; a nourishing, coconut water - infused primer that helps to revive lacklustre skin and prolong makeup wear without compromising on hydration. At first the coconut fragrance can be overpowering, especially if you're not too keen on the scent like myself, but it soon disappears upon application. This primer acts like a moisturiser; delivering intense hydration and a radiant finish whilst locking down my makeup for extra longevity. Unlike other radiance - enhancing primers I've used, I actually find that this one gives off a significant amount of glow without needing any glitter particles in the formula; perfect for those who like a semi-matte base. It glides along the skin, soothing my dry patches and leaving a dewy finish on the skin which my foundation loves. This primer has continued to transform my skin during the cold Winter months and I'm sure it will continue to do so come Spring. 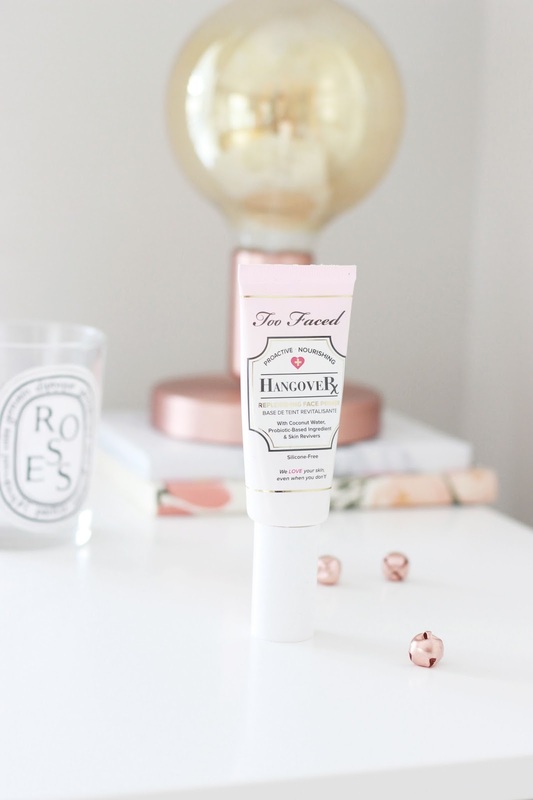 Have you tried the Too Faced Hangover Primer?